Inspired by the items worn by Sir Richard Attenborough in the 1994 Miracle on 34th Street movie, we are pleased to be offering these custom-designed holly leaves and 5-button combination sets. Available for a very limited time, these sets would regularly be $150 to $175. Match one of our 18k gold-plated holly buckles with either of our five button reindeer button sets. One set has a very striking look to them because the high relief parts: the reindeer, rope border, holly leaves and the name banners are all shiny. The remainder of the button has a satin finish and are 1.25-inches in diameter. Buttons are engraved with five different name pairs: Dasher/Dancer, Donder/Blitzen, Comet/Cupid, Prancer/Vixen, and Santa/Rudolph. 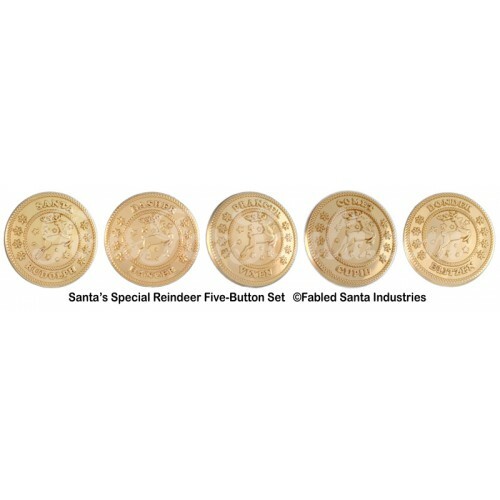 The second set is our very popular Santa's Special Reindeer Button Sets - with exceptionally fine details and a very bright, shiny finish. These buttons are 1-3/8ths inches in diameter. All custom-designed and produced by Fabled Santa for Fabled Santa Industries. Don't miss this outstanding value as this 20-40% off sale may not last long and some supplies are limited.